Do people really want to buy cars online? SAN ANTONIO -- While there is a segment of car shoppers who want to buy vehicles online in an Amazon-like experience, a new report indicates dealers may be overestimating how strong consumer demand for this capability really is. 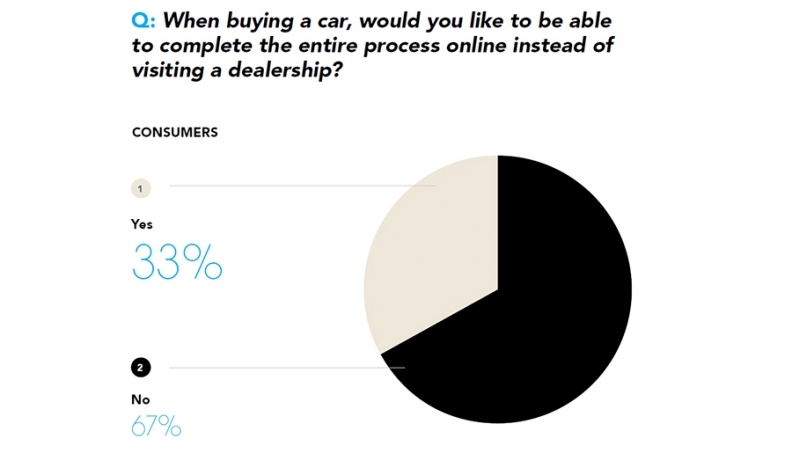 DealerSocket's 2016 Dealership Action Report says two-thirds of franchise dealers believe consumers would like to complete the entire buying process online, but only one-third of consumers who were surveyed said they'd want to do so. DealerSocket says the data show there's a false sense of urgency to take car buying online. The survey results come as a growing number of stores invest in digital options, either via in-house projects such as those at giant retailers AutoNation Inc. and Penske Automotive Group Inc., or through third parties such as Roadster, which launched an online-shopping platform for dealership websites over the summer in California. But DealerSocket says this disconnect could be taken as a positive, because it shows that dealers are looking to stay ahead of the curve. Online used-car buying services such as Beepi and Carvana have gotten the attention of dealerships and the media, said Nathan Usher, DealerSocket's business development director. "We've seen disruptors in our industry and that's what causes a lot of the articles to be written and the interest in what Beepi and Carvana are doing," he said at the DealerSocket User Summit in San Antonio. "They see that, and you've got the Teslas of the world," which sell online. "Dealerships have looked at that and said we need to have that experience," he said. But "there are a lot of consumers out there that still are not ready, so it's not a silver bullet yet." Attitudes toward online sales vary sharply by income level. Half of surveyed consumers earning $100,000 to $149,000 annually would like to bypass the dealership and buy vehicles online, DealerSocket said. In contrast, 29 percent of people making $25,000 to $49,000 said they'd like to buy vehicles online. In addition, 37 percent of men want to buy vehicles online, while 29 percent of women do. Marylou Hastert, DealerSocket's director of product marketing, said stores should prepare for the digitization of car buying, but not at the expense of in-store processes. DealerSocket partnered with Google on the report, surveying during August more than 2,000 consumers who purchased a vehicle in the last year.